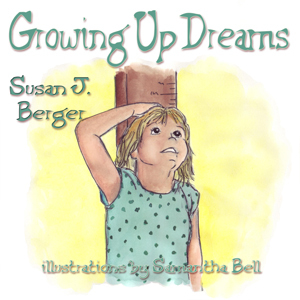 A journey through one girl’s imagination is waiting for your three- to seven-year-old in Growing Up Dreams by Susan J. Berger. Wouldn’t it be wonderful to grow dreams? That’s just what this little girl is doing as she imagines the endless possibilities that await her in the future. This is the third book of Berger’s that I’ve read–two fiction and one non-fiction. I truly wonder if she’s still a child inside because she knows how to create stories that children love. She also must enjoy dreams because both of her kid’s fiction books with Guardian Angel Publishing are about dreams, which leaves tons of room for the imagination to fly. Add dreams to the rhyming patterns of the verses and you’re sure to have a winner. Artist Samantha Bell created the artwork for Growing Up Dreams. I had a chance to look at her black and white drawings in Burgher and the Woebegone by Kim Chatel, but this is the first time I’ve had the pleasure of seeing her color illustrations up close. From the yellow stars on the girl’s pajamas to the long tails of the monkeys, these delightful illustrations will thrill the reader and keep her turning the pages just as much as the story does. A fun and imaginative read is what readers will enjoy in Growing Up Dreams. Jamie had a wonderful dream, and now he wants to buy it for his mom. But his mom, the crossing guard and Jamie’s teacher aren’t sure you can buy a dream. Since Jamie is having a great day, though, he isn’t easily detered. When he meets up with Chester the Unicorn, they go on an adventure in search of his dream and something wonderful happens. What a charming and imaginative story! Susan’s son Christopher helped her write Jamie’s Dream when he was only nine years old. Now an actor who likes to write comedy, you catch a glimpse into the inspiration and creativity flowing through Chris with Jaime’s Dream. The real world may be limiting, but as the reader soon discovers, the world of imagination knows no bounds. Your young reader will be totally captivated by Jamie’s journey to where he uncovers Dreams R Us, and an old man with a long silver beard helps Jamie find his dream. 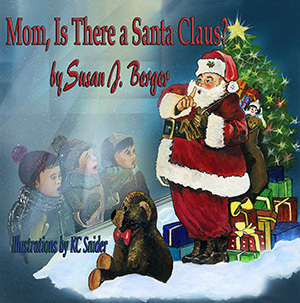 The illustrations by Kim Sponaugle are beautiful and warm. This is the first time I’ve seen her work, and I’ll definitely be looking for more of it. Susan and Chris make a great writing team. I hope to see more from them in the future. Get ready to rumble! Loaded with helpful information and oftentimes humorous illustrations, Earthquake by Susan J. Berger is an excellent resource for students or children interested in learning more about this natural disaster. Epicenter and faults, aftershocks and the Richter Scale are all explained, along with less known terms such as “Ring of Fire” and seiches. Also included are easy experiments for children to try at home and a craft, in addition to information on how to prepare for an earthquake and what to include in your home backpack to prepare for emergencies. 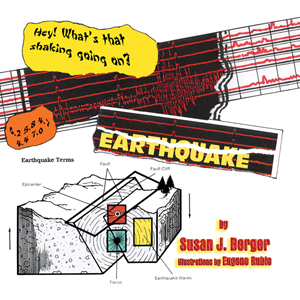 Earthquake by Susan Berger is a great way for children to learn the facts about earthquakes, and the illustrations by Eugene Ruble help to make that learning fun!